Although few and far between, the Indian Ocean boast some of the world’s most exotic islands. With the likes of Madagascar, Mauritius, the Maldives, Zanzibar and Seychelles, all of the ocean’s most precious gems lay below the equator in the Southern Hemisphere, all that is, but one… Sri Lanka, possibly the most exotic and diverse of them all. This verdant, teardrop-shaped island hangs like a diamond off the south eastern coast of India. At its closest point it lies just 30 kilometres from the Indian coast. This location gives it a diversity not seen on the other islands. It boasts two separate monsoon seasons, over 1,300 kilometres of white sandy beaches, steamy tropical jungles and cooler mountain highlands. This diversity also permeates through its culture and extends to its people, its food and almost every aspect of life. Celebrating 70 years of independence, Sri Lanka’s diversity was shaped well before colonial times. 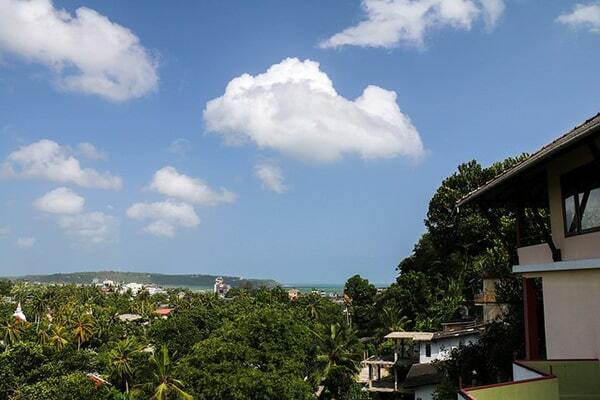 The former English colony of Ceylon has a documented history of over 2,000 years, but is recognised to be much older. As overland trade on the Silk Road became plagued with bandits, merchants looked to the sea to transport their wares safely. Situated strategically in major Indian Ocean sea lanes, by the 5th century, Sri Lanka became the central hub for a network of trade routes, including the main east-west routes once plied by the Silk Road. As a trading nation, all sorts of goods came and went from all four corners of the island to many parts of the world. Goods exchanged in Sri Lanka included ceramics and silks from China, gold, pearls, precious stones, spices and fabrics from India, wines, fabrics, glass, ceramics, perfume and horses from Egypt and Persia. 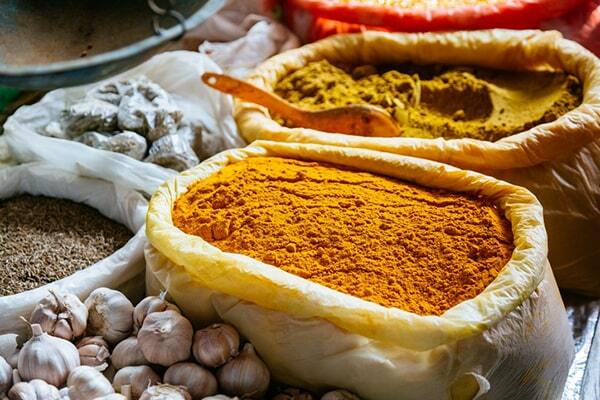 Chances are, that if you have any tea, cinnamon, curry or coconut oil in your kitchen, then you’ve already got something from this unique island. Europeans first came to Sri Lanka in 1505. Portuguese traders landed on the island in search of various spices, annexed the island’s coast and began to spread Catholicism. In 1658, it was the Dutch’s turn to control Sri Lanka, but the British had other ideas and took control in 1796. After establishing settlements, the British then overthrew the city of Kandy to formally take control of the island in 1815 and created the Crown Colony of Ceylon. 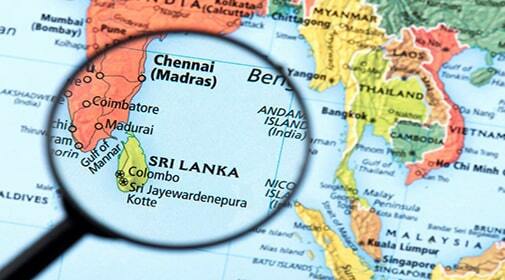 During British rule, Sri Lanka’s economy was based mainly on tea, rubber and coconuts. In 1931 however, the British granted Ceylon limited self-rule, which eventually led to its independence on February 4, 1948. The legacy of the English colonial years remains today in the language, architecture and industry. Not everything that came to Sri Lanka was exchanged by merchants. Passed on from India thousands of years ago, Buddhism encapsulates all parts of the island, but especially in the south, the central highlands and the west. The Sinhalese Buddhists are the largest ethnic group in Sri Lanka. Owing to its proximity, the north of the country is heavily influenced by southern Indian culture and its Tamil population are Hindu. Ten per cent of the population practice Islam and are mainly Sunni muslims. On the southern coastline, many churches can be found, a legacy of its colonial heritage, although Christians are a minority at only seven per cent. 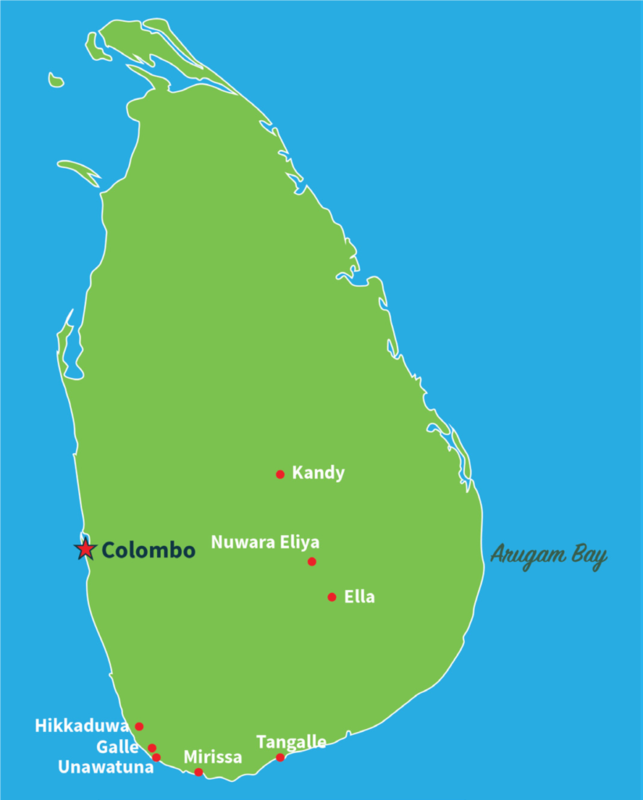 During early settlement of Sri Lanka, Sinhalese and Tamil rulers often clashed for control the island. The Tamils eventually claiming the northern part of the island and the Sinhalese controlling the south to which they migrated. Since independence, conflicts again arose between the Sinhalese and the Tamils and in 1983 a civil war began in which the Tamils demanded an independent northern state. The instability and violence continued through the 1990s and into the 2000s. By the late 2000s, sustained international pressure ended the instability and violence and today the government is working hard to repair and unify the country. Sinhala and Tamil remain the official languages of the country. With roughly the population of Australia and even with its long history of instability and conflict, more than anything else, it’s the people who have maintained Sri Lanka’s character and charm. Throughout the island, warm, friendly faces welcome visitors from every corner of the planet. They are engaging, encouraging, humorous and hospitable. Nowadays, with relative stability having been restored, Sri Lanka’s economy is growing and visitors are returning in increasing numbers. English, although not commonly spoken in rural areas, is spoken by roughly 10 per cent of the population. It is widely used in official and commercial situations and on many shop signs in urban areas. The tourist industry especially works in English. A very unique aspect of Sri Lankan culture is its regard for women. Women have been viewed as equals for thousands of years, from ruling the country to how they dress. This is true up to today, the world’s first female prime minister, Sirimavo Bandaranaike, was from Sri Lanka. 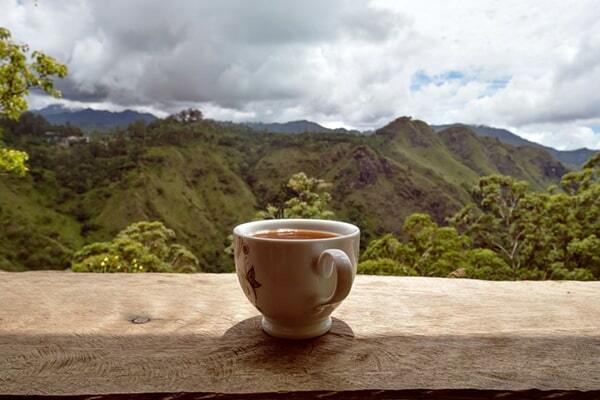 Most Australians will likely know Sri Lanka for its cricket and its tea. Sports plays a very important part in the culture of both countries and cricket dominates relations between the two. 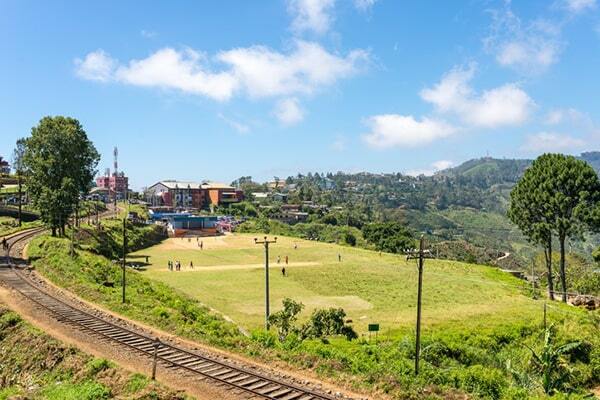 Cricket is the most popular sport in Sri Lanka and as such the hundreds cricket fields scattered across the island are filled with children and adults playing the sport. Even more popular than playing, is watching the Sri Lankan national team play. The country comes to a standstill when important matches are televised. This was the case in 1996, when the Sri Lankan team beat Australia in the finals to win the Cricket One Day World Cup. The whole country was shut down and a curfew imposed upon the whole island. Sri Lanka’s tea industry grew at the expense of their coffee industry, which fell victim to a devastating fungal disease called “Coffee Blight” in the 1870’s. James Taylor, a British citizen, recognised the need to plant a different crop and introduced tea to British Ceylon soon after. He arrived in 1852 and settled down in Loolecondera estate in Galaha. Here he worked with Thomas Lipton, a Scottish immigrant, to develop the tea industry. Most tea plantations are found in the central highlands and in the southern foothills where they employ more than 1 million people. A popular place to visit the plantations is Haputale in the south-central highlands. Elevated at 1,431 metres above sea level, the town is surrounded by cloud forest and tea plantations. Here you can visit “Lipton’s Seat”, a panoramic viewpoint perched on the edge of the escarpment with a view out to the southern beaches and overlooking hundreds of acres of tea plantations. Thomas Lipton himself used to spend many hours here admiring the view. Sri Lanka’s flora, fauna and landscapes make it one of 34 “biodiversity hotspots” of the world, with a large proportion of endemic species ensuring it relies heavily on its biodiversity for tourism. Conservation International estimate that there are over 3000 endemic plant species, 140 endemic species of amphibians, 14 endemic species of mammals and 10 endemic species of birds in Sri Lanka. 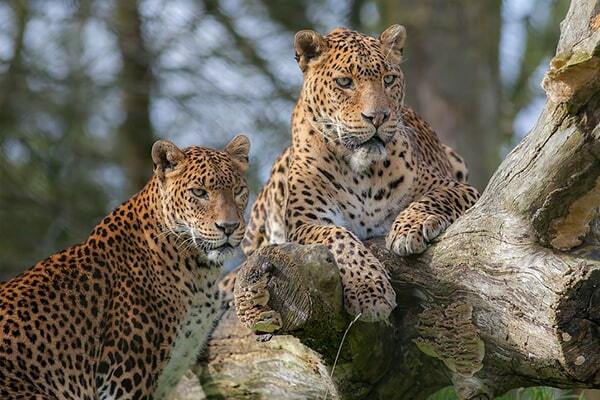 As with Africa, a visit to Sri Lanka is not complete without catching a glimpse of “The Big Five”. The Humpback Whale, the Sri Lankan Elephant, the Sloth Bear, the Sri Lankan Leopard and the Sambar (a brownish deer) are high on the agenda for most visitors to the country. Also at the top of the food chain are the Estuarine Crocodile, the Jackal, the White-bellied Sea Eagle, the Ceylon Fishing Cat and the Rock Python. Sri Lanka’s rich biodiversity is probably the result of a number of varied climatic zones in such a small area. Ranging from arid, sunny beaches in the south-east to steamy tropical rainforests near the south-western coast, to a soothing temperate climate in the central hills. Although a small island nation, the difference in temperatures in these places on any given day could be as much as 20 C.
The island possesses a coastal plain containing a host of geographic features such as lagoons, wetlands, rivers and various types of wildlife-rich jungle. The plain ends in the southern foothills where the land starts to climb into mist-shrouded mountains that are home to hundreds of gushing waterfalls. 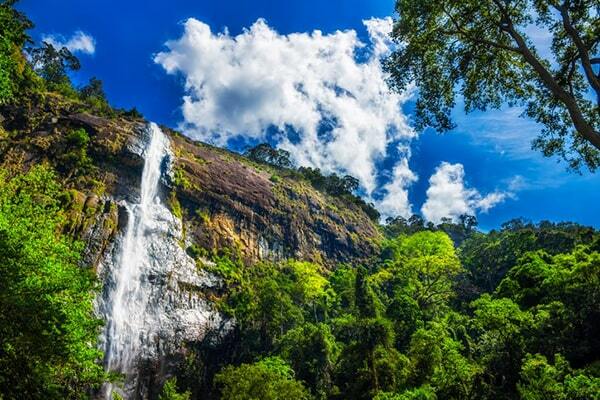 For its size Sri Lanka has possibly the highest number of waterfalls of any country. 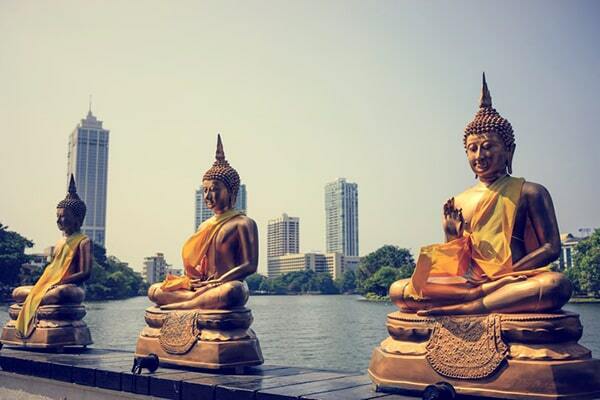 More recently, Sri Lanka has grown into a tourist favourite and investment in infrastructure is gearing up. Being part of Asia, its proximity to Australia means getting there is easy. 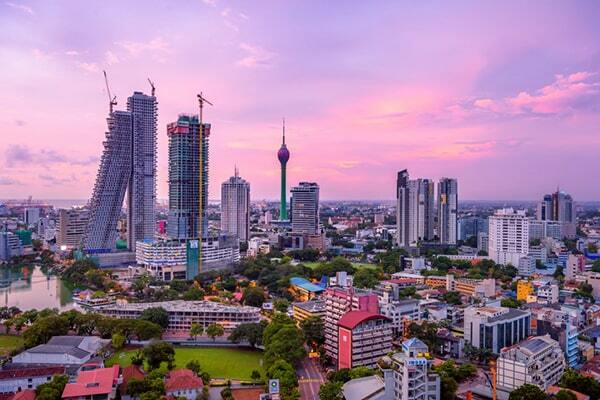 You can even fly direct from Melbourne to Colombo (Sri Lanka’s capital, picture below) on Sri Lankan Airlines in just over 10 hours. Qantas will get you there in little over 14 hours with a stop in Singapore, while Malaysian Airlines take just under 14 hours with a stop in Kuala Lumpur. Qantas, Singapore Airlines and China Southern shave three hours off those times by flying from Perth with one stop. Sri Lanka also enjoys a close proximity to other fantastic locations too. Southeast Asia, India, the Maldives, the Middle East, the UAE and Oman from where you can transfer onwards to Europe. This proximity and availability of flights has also seen an increase in the number of expats moving to Sri Lanka to work in the tourism, private businesses, NGO’s and education sectors. A virtual neighbour to Australia, Sri Lanka has been transitioning to a new time of peace, which allows it to showcase her natural beauty and hospitality. Warm, friendly faces are eager to welcome you with their infectious charm and gracious hospitality. This diverse diamond of an island in the Indian Ocean is waiting for you. What’s the Weather like in Sri Lanka?